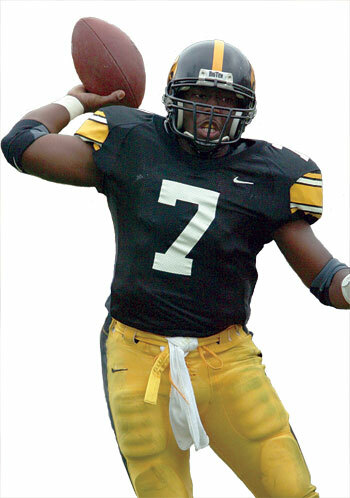 An all-American quarterback, Brad Banks guided the 2002 Hawkeyes to an 11-2 record, a share of the Big Ten title, and an appearance in the 2003 Orange Bowl. As 2002 Big Ten Offensive Player of the Year, he led the nation in pass efficiency, set Iowa and conference records for passing percentage, and held the most rushing yards by an Iowa quarterback in a single season. Banks' postseason honors included the Chicago Tribune Silver Football Award as the Big Ten's most valuable player, the Davey O'Brien Award for best quarterback, and the AP College Football Player of the Year. He also placed second to University of Southern California's Carson Palmer for the 2002 Heisman Trophy. Though Banks wasn't drafted into the National Football League, he spent five seasons in the Canadian Football League with the Ottawa Renegades, Winnipeg Blue Bombers, and Montreal Alouettes. Last year, he led a youth football camp in Palm Beach, Florida. Banks received a warm welcome this past spring when he returned to Iowa to play with the Barnstormers in the Arena Football League (AFL). He joins fellow Hawkeyes Rodney Filer and Pete Traynor, 03BS, on the Des Moines-based team. Three games into his AFL career, Banks set a franchise record with ten touchdown passes against the San Jose SaberCats.